Home » international news » Iran and India: Is East-East dialogue possible? The visit by Iran’s president to New Delhi came at a challenging time for Iranian diplomacy. Though Rouhani’s arrival in India could be interpreted as a continuation of India-Iran economic and political relations and Modi government’s opening up to West Asian markets, however surprisingly it came immediately after the friendly and politically engaging trip of Israeli prime minister. India has long been considered by Iran as a potential natural gas customer. The two countries decided various times over the last decade a pipeline from Iran, though Pakistan and to India, but geopolitical difficulties between Iran and the West complicated this mutual effort. During his visit the Iranian President signed around a dozen memoranda of understanding. In one of their meetings Hassan Rouhani and Narendra Modi outlined long-term partnerships and a desire to reach positive results on energy cooperation. This comes as no surprise, since India is counting on Iran to meet its needs on oil and gas in the context of sustainable strategic plans. 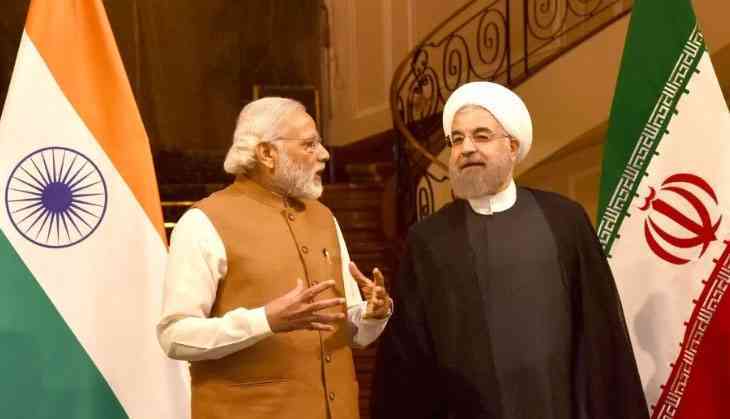 Iran and India also exchanged views on the $500-million Beheshti port project in Chabahar through which India is routing a consignment of 1.1 million tonne wheat to Afghanistan. Previously a Trilateral Transit Agreement was signed by transport ministers of India, Iran and Afghanistan in the presence of Modi, Rouhani and Afghan President Ashraf Ghani. The contract entails capital investment of $85 million by India for equipping Chabahar port in southeastern Iran. Let us not forget that India and Iran had a bilateral trade of $12.89 billion during the fiscal year 2016-17. India imported $10.5 billion worth of goods, mainly crude oil, and exported to Iran commodities worth $2.4 billion. There have also been close talks between Modi and Rouhani on the pending negotiations over the upcoming meeting of the UN’s Financial Action Task Force, where Iran is asking India’s help to exit the blacklist on terror finance. This is not the first time that India is caught in the middle of a fight between Iran and the U.S. India has been caught up in the US-Iran nuclear imbroglio before. During the Obama administration, India tried to purchase oil from Iran, through Delhi’s payment system to Tehran via a bank in Turkey which was shut down by Washington. Also, in recent years India has been voting against Iran at the United Nation’s IAEA meetings and committing to invest in the Farzad B field, exclusively assigned to India by Iran, without delivering. Even if during Modi’s visit to Tehran in 2016 the negotiations did not make much progress, both Iran and India are optimistic to find a bi-lateral solution to the problem. Rouhani’s New Delhi visit, despite all the difficulties, was a good opportunity for both Iran and India to discuss closely their strategic collaborations over the Kashmir problem and the regional dynamics of West Asia. Therefore, despite their past disappointments with India, Iranian authorities continue to stress their interest in expanding their political and economic ties with India. This is a natural gesture coming from the Iranian side when one understands that since the independence of India, the relations between the two countries have been essentially peaceful, friendly and constructive. They became even more fruitful and productive after the Iranian revolution of 1979, the war in Afghanistan and the tense Iranian-Pakistani ties. One reason to this is that the long history of the two civilisations is intertwined. But also because after the political developments in Afghanistan and the deterioration of Iranian-Pakistani relations, Iran’s interest in India as a potential security partner has increased. That is to say, the next few years are likely to be a great period for both countries in relation to bilateral economic cooperation, student exchanges, cultural matters and especially a constructive engagement and mutual initiative for a regional dialogue and a vital bridge making between East and East.